There have been so many leaked spy pics and teaser shots of Triumph’s new Tiger 800 in both its guises that’s there’s not much left to see – but this pic is the best view yet of the whole XC version. 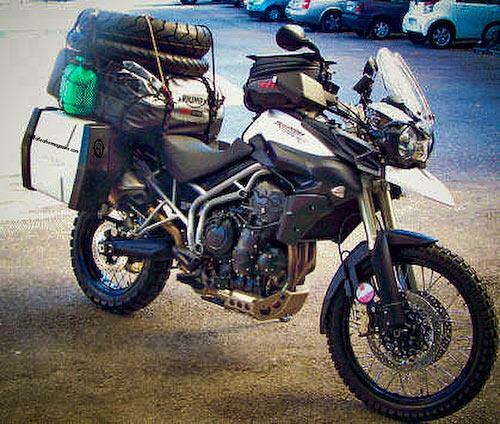 Originally posted on the web by Greek site 0300.gr, the pic reveals how closely the new, off-road-orientated XC, echoes the style of its closest rival, BMW’s F800GS. This fully-loaded example is believed to be a pre-production test machine undergoing long-distance and off-road testing and was snapped in Greece en-route to Africa. Read MCN’s world exclusive first ride of the new Tiger in next week’s Motorcycle News, out October 27.